Interior with vivid character in art deco was developed by designers of studio Luxury Antonovich Design. The multi-faceted in its luxurious image design is also unique for its beauty, unique as the owner of the apartment in Dubai. 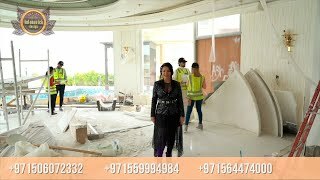 The interior design UAE from the studio Luxury Antonovich Design is the creation of an ideal environment for our valued customers. Interior touches the delicate strings of the soul and reflects exactly idea of ​​own ideal home, which customers tell about. Tenderness of the hall with the brilliance of crystal, smooth surface of marble floors and mirrors takes us into the vivid and radiant image of the luxury living room interior. Upholstered furniture in noble velvet of saturated purple color, at the background of which gloss furniture of shade of chocolate looks bright. The interior exudes a wonderful mood of the eternal celebration of life. The unique beauty of the floors and ceilings design makes handwriting of studio works recognizable and so popular. Apartment Interior design Dubai has many faces and is unique with a variety of spectacular design techniques. The ceiling in the living room was decorated with two massive crystal chandeliers that sparkle delightfully surrounded by mirror panels with facet and blue lights. Bright and passionate mood of the living room is continued in luxury kitchen. Here amazing milk and purple shades contrast. Festive mood gently mutes the cozy bedroom interior. Silk of milk chocolate shade, cream-colored hues in the decoration of the walls and exquisite decor items filled the bedroom interior with wonderfully cozy mood.